A normal endowment of nephrons in the mammalian kidney requires a balance of nephron progenitor self-renewal and differentiation throughout development. Here, we provide evidence for a novel action of ureteric branch tip-derived Wnt11 in progenitor cell organization and interactions within the nephrogenic niche, ultimately determining nephron endowment. In Wnt11 mutants, nephron progenitors dispersed from their restricted niche, intermixing with interstitial progenitors. Nephron progenitor differentiation was accelerated, kidneys were significantly smaller, and the nephron progenitor pool was prematurely exhausted, halving the final nephron count. Interestingly, RNA-seq revealed no significant differences in gene expression. Live imaging of nephron progenitors showed that in the absence of Wnt11 they lose stable attachments to the ureteric branch tips, continuously detaching and reattaching. Further, the polarized distribution of several markers within nephron progenitors is disrupted. 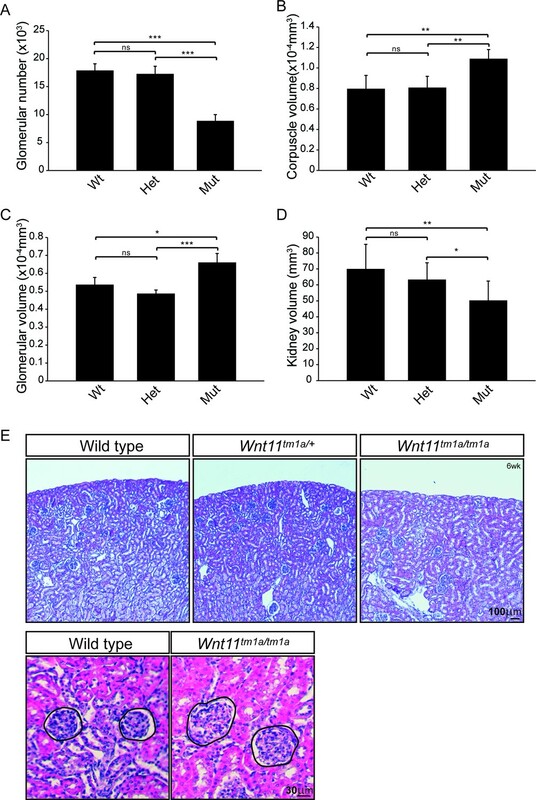 Together these data highlight the importance of Wnt11 signaling in directing nephron progenitor behavior which determines a normal nephrogenic program. The developing mammalian kidney contains three distinct progenitor niches in the active nephrogenic zone. They consist of the mesenchymal nephron and interstitial progenitor cells and the epithelial ureteric progenitor cells (McMahon, 2016). The progenitor niches are self-renewing and give rise to the majority of cell types that make up the mature kidney (Kobayashi et al., 2008; Self et al., 2006; Kobayashi et al., 2014; Costantini, 2012). There is a distinct organization of these cell types within the nephrogenic niche. Nephron progenitors tightly cap ureteric branch tips throughout the arborization of the ureteric epithelial-derived collecting duct system, separating the ureteric branch tips from interstitial progenitors which lie at the kidney cortex. The interstitial progenitors also infiltrate the space between adjacent nephron progenitor caps (McMahon, 2016). This distinct niche organization is maintained throughout the course of kidney development, suggesting it may be significant for proper nephrogenesis. A recent study uncovered the dynamic movements of nephron progenitors within and between niches when not tightly associated with the branch tip (Combes et al., 2016). Control of nephron progenitor behavior through yet unknown mechanisms is likely critical for niche maintenance. Genetic studies and cell culture experiments have provided extensive evidence for a complex interplay of signaling interactions amongst these progenitor populations through Wnt, Bmp, and Fgf mediated pathways (Majumdar et al., 2003; Nagy et al., 2016; Carroll et al., 2005; Park et al., 2007; Karner et al., 2011; Luo et al., 1995; Dudley et al., 1999; Blank et al., 2009; Tomita et al., 2013; Muthukrishnan et al., 2015; Brown et al., 2011; Barak et al., 2012; Motamedi et al., 2014). Amongst Wnt-family members, Wnt9b and Wnt11 produced by ureteric epithelial cells, regulate distinct programs in overlying nephron progenitors. Wnt9b is required for both the expansion of uncommitted nephron progenitors and the commitment of a subset of nephron progenitors to enter a nephron forming program, in conjunction with the branching growth of the ureteric epithelial network (Carroll et al., 2005; Park et al., 2007; Karner et al., 2011). The co-requirement for the Wnt pathway transcriptional co-activator, β-catenin, in these events suggest Wnt9b acts through the canonical Wnt pathway (Park et al., 2007; Karner et al., 2011; Wiese et al., 2018), although Wnt9b also has roles in tubular morphogenesis via non-canonical planar cell polarity pathways (Karner et al., 2009). Unlike Wnt9b which shows lower expression in branch tips immediately adjacent to nephron progenitors than in tip-derived cells of non-branching stalks, Wnt11 expression is highly restricted to branch tips, from the earliest stages of kidney development (Majumdar et al., 2003; Kispert et al., 1996; Combes et al., 2017). Expression of Wnt11 is positively regulated by nephron progenitor and potentially interstitial progenitor-derived Gdnf, acting through the Ret receptor pathway in ureteric branch tips (Majumdar et al., 2003; Costantini and Shakya, 2006; Magella et al., 2018). 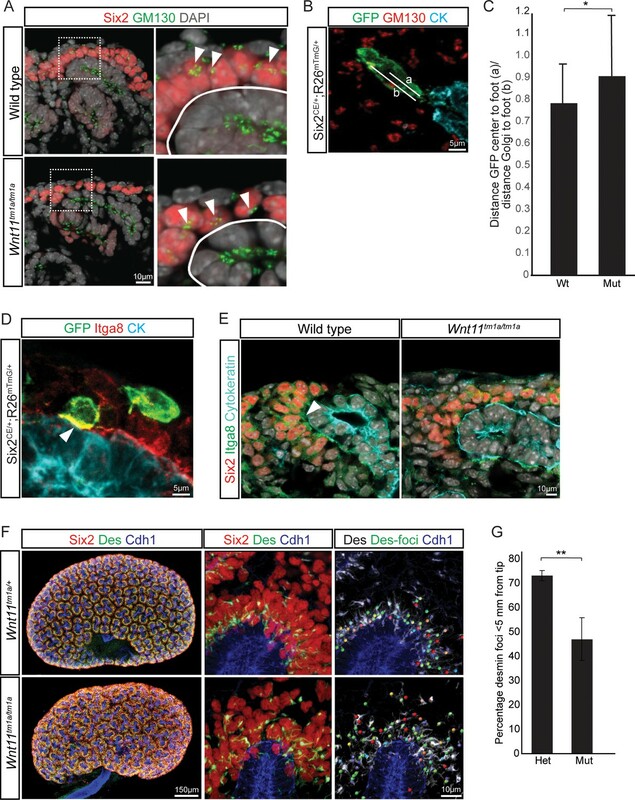 Wnt11 signaling acts back on nephron progenitors to maintain a level of Gdnf expression sufficient for normal branching morphogenesis of the ureteric epithelium (Majumdar et al., 2003). Wnt11 generally works through non-canonical mechanisms in regulating developmental processes such as convergent extension and cardiogenesis (Heisenberg et al., 2000; Tada and Smith, 2000; Nagy et al., 2010; Zhou et al., 2007). Non-canonical Wnts control cellular behaviors including motility, adhesions, and rearrangements of the cytoskeleton independent of β-catenin mediated transcriptional regulation (Wiese et al., 2018; van Amerongen, 2012). Whether Wnt11 acts through similar non-canonical mechanisms in the developing kidney remains to be determined. Recently, analysis of the Wnt11 mutant phenotype on the C57BL/6 background allowed for the survival of a subset of mutants until adulthood (Nagy et al., 2016). In these animals, tubular morphology was disrupted and glomerular cysts observed, both likely culprits for the compromise in kidney function. The expression of Wnt11 in the tubular epithelium of both postnatal mice and adults may be partially responsible for this phenotype. Alternatively, alterations to the expression of Six2, Wnt9b, Gdnf, and Foxd1 were seen in developing Wnt11-/- kidneys suggesting the downregulation of these genes could contribute to the phenotype (Nagy et al., 2016). Despite further informative characterization of the Wnt11 mutant phenotype, a fundamental understanding of actions immediately downstream of Wnt11 signaling during kidney development is still lacking. Our examination Wnt11 mutant kidneys revealed a novel requirement for Wnt11 signaling in the organization of nephron progenitors within the nephrogenic niche. Here, we present evidence that the tight organization of nephron progenitors around ureteric branch tips is characterized by a Wnt11-dependent interaction of nephron progenitors with underlying epithelial cells through stable cytoplasmic extensions. Following the loss of this dynamic interplay, the balance between maintenance and commitment of nephron progenitors is offset towards commitment, prematurely depleting the nephron progenitor reserve, resulting in smaller kidneys with fewer nephrons. Taken together with studies of Wnt9b, the new findings indicate nephron progenitors are likely to integrate both canonical (Wnt9b) and non-canonical (Wnt11) signaling pathways in developmental regulation of the nephrogenic niche. Previous reports suggested that branching morphogenesis is disrupted in Wnt11 mutants, leading to smaller kidneys (Majumdar et al., 2003). However, an understanding of molecular mechanisms underpinning the phenotype were lacking. Additionally, the postnatal lethality precluded analyses of adult phenotypes. We took advantage of the Wnt11 knockout-first reporter allele available from the EUCOMM/KOMP repository to analyze the mutant phenotype in greater detail (Skarnes et al., 2011). The insertion of a cassette with an alternate splice-acceptor terminates the transcript after exon two and an Internal Ribosomal Entry Site (IRES) promotes lacZ reporter expression. This allele (Wnt11tm1a) disrupts the Wnt11 transcript shortly after the N-terminal signal peptide required for ligand secretion (Figure 1—figure supplement 1A,B; Willert and Nusse, 2012). We compared β-galactosidase activity to Wnt11 in situ expression patterns at embryonic day 11.5 (E11.5), E15.5, and postnatal day 2 (P2) and confirmed the reporter recapitulates Wnt11 expression in the ureteric tips throughout kidney development (Figure 1—figure supplement 1C,D). The line was maintained on a C57BL/6J background which enabled survival of the Wnt11 mutant (Wnt11tm1a/tm1a) mice into adulthood. We utilized antibodies against Six2, a definitive regulator of nephron progenitor self-renewal (Kobayashi et al., 2008; Self et al., 2006), together with a pan-cytokeratin antibody that recognizes the ureteric epithelium (Krt8/18) (Oosterwijk et al., 1990), to obtain an overview of niche organization in wholemount kidney preparations (Figure 1A). Strikingly, analysis at E15.5 showed a marked dispersion of Six2+ nephron progenitors in nephrogenic niches of Wnt11 mutants (Figure 1B). Consistent with wholemount observations, tissue section revealed Six2+ nephron progenitors were no longer tightly clustered around ureteric branch tips in Wnt11 mutants (Figure 1C, right panels). The disorganization of nephron progenitors was evident as early as E11.5, shortly after outgrowth of the ureteric bud, the initiating morphogenetic event in mammalian kidney development (McMahon, 2016). Six2+ cells were less organized and more rounded in appearance compared to the tightly elongated, aligned nephron progenitors present in wild type kidneys (Figure 1C, left panels). By E13.5, Wnt11tm1a/tm1a nephron progenitors showed a similar scattering to that observed at E15.5 (Figure 1C, middle panels). At birth, large subsets of progenitor niches had completely disappeared, three days prior to the normal loss of the Six2 +nephron progenitor population and cessation of nephrogenesis (Figure 1D,E; Hartman et al., 2007; Rumballe et al., 2011). Wnt11 mutants have persistent loose, disorganized nephron progenitor niches that prematurely dropout. (A) Schematic of the nephrogenic niche. Wnt11 is secreted by the ureteric branch tip cells. (B) Wholemount immunostained kidneys were analyzed at E15.5. Confocal images show that Wnt11tm1a/tm1a Six2 +nephron progenitors (red) are dispersed from the ureteric branch tips (grey) and rounded in appearance compared to wild type cells. A 4x zoom in the far-right panel highlights the differences in cellular distribution and morphology. (C) Wholemount immunostained wild type and Wnt11 mutant kidneys were analyzed at E11.5, E13.5, and E15.5. Wnt11tm1a/tm1a Six2 +nephron progenitors are more rounded and less organized than wild type counterparts beginning at E11.5 (view shows slice from a z-stack). The disorganized phenotype is clear in whole kidney views (maximum intensity projection) at E13.5 and E15.5. Insets highlight the disorganization in whole kidney views. The far-right panel shows a cryosection of E15.5 wild type and Wnt11 mutant kidneys immunostained for Six2, highlighting the dispersed phenotype is also evident in section. (D) Wholemount immunostains of P0 kidneys show the persistent disorganized phenotype and associated premature dropout of Six2 +nephron progenitor niches (red). (E) High resolution confocal views highlight the premature dropout of Six2 +nephron progenitor niches (red) around cytokeratin +ureteric epithelium (grey) in Wnt11tm1a/tm1a kidneys. Quantitative analysis showed a statistically significant decrease in the kidney-to-body weight ratio (20%), an overall reduction in kidney volume (37%), and a 41% deficit reduction of branch tips in Wnt11tm1a/tm1a kidneys (Figure 1—figure supplement 2A–D; Figure 1—source data 1). We predicted that the premature depletion of nephron progenitors would affect adult nephron endowment. Indeed, glomerular counts performed six weeks after birth showed only 50% of the normal nephron number in Wnt11 mutant mice (Figure 2A; Figure 2—source data 1). Despite this significant deficit, Wnt11tm1a/tm1a kidney volume was only reduced by 28% compared to wild type animals (Figure 2D; Figure 2—source data 1) reflecting compensatory hypertrophic growth, evident in the increased size of glomeruli (18%) and renal corpuscles (27%) in Wnt11 mutants (Figure 2B,C,E; Figure 2—source data 1). Nephron numbers are reduced in Wnt11tm1a/tm1a adults leading to compensatory hypertrophy. (A) The physical disector/fractionator method was used to estimate glomerular number in 6 week old animals. A significant reduction is found in Wnt11 mutants. (B) Renal corpuscle volume is increased in Wnt11 mutant kidneys. (C) Glomerular volume is larger in Wnt11tm1a/tm1a kidneys. (D) Estimated kidney volume is reduced in Wnt11 mutants. (E) Histological sections stained with hematoxylin and eosin highlight that overall morphology is preserved, although glomerular/corpuscle volume is increased in the Wnt11 mutants. All error bars represent SEM. All significance values were determined by t-test. ns = p > 0.05, * = p < 0.05, ** = p < 0.01, *** = p < 0.001. n = 6 for each genotype. Next, we performed quantitative analyses on wholemount immunostained kidneys at E15.5 to identify differences in niche metrics. Samples were subjected to optical projection tomography (OPT) and confocal imaging for subsequent quantitative analyses (Figure 3A; Short et al., 2014). The nephrogenic niches within Wnt11tm1a/tm1a mutant kidneys contained a larger number of Six2+ nephron progenitors compared to wild type kidneys: a 1.3-fold increase from an average of 365 to 466 Six2 +cells per niche (Figure 3B;Figure 3—source data 1). However, despite the increase in cell number, there was no statistically significant change in nephron progenitor niche (cap) volume (Figure 3C; Figure 3—source data 1). Similar to nephron progenitors, the number of cells per ureteric tip was increased 1.5-fold in Wnt11tm1a/tm1a kidneys compared to controls (Wt = 162, Het = 169, Mut = 248; Figure 3D; Figure 3—source data 1). Accordingly, tip volumes were increased 1.6-fold in mutants (Figure 3E; Figure 3—source data 1). OPT analysis, which provides a clear overview of ureteric tree metrics, indicates Wnt11 mutant kidneys were smaller than control kidneys. Wnt11tm1a/tm1a kidney ureteric tree volume was reduced to 67% of wild type (Figure 3F; Figure 3—source data 2). Accordingly, ureteric tree length was 30% shorter in Wnt11 mutants (Figure 3—figure supplement 1C). In line with the reduced kidney size, mutant kidneys had 33% fewer ureteric tips (Wt = 609, Het = 532, Mut = 407; Figure 3G; Figure 3—source data 2). However, overall branching patterns were similar among genotypes suggesting normal but slightly delayed morphogenesis (Figure 3—figure supplement 1A). These data are consistent with Wnt11 mutants having smaller, developmentally younger kidneys (Short et al., 2014). Several of the kidneys analyzed (5/8) had prematurely terminated branch tips internally (Figure 3—figure supplement 1A,B) which may indicate that these tips had lost their association with the nephron progenitors or inductive signals at some point during development. Quantitative analyses reveal significant alterations to niche metrics and accelerated nephrogenesis in Wnt11tm1a/tm1a kidneys. (A) Schematic of the developing kidney highlighting the niche and structure metrics quantified after imaging by either confocal or optical projection tomography (OPT). E15.5 wholemount immunostains were performed with α-Six2 and α-pan cytokeratin antibodies and kidneys subsequently imaged by confocal microscopy for analyses in B-E, H, and I or OPT for analyses in F-G. (B) The number of Six2 +nephron progenitors per niche were quantified and reveal an increase in Wnt11 mutants. (C) The overall volume of each nephron progenitor niche (cap) is not significantly different between wild type and Wnt11 mutants. (D) The number of DAPI +cells were quantified in each cytokeratin +ureteric branch tip niche and were increased in Wnt11 mutants. (E) Ureteric branch tip volumes were measured and are larger in Wnt11 mutants, correlating with the increase in tip number. (F) Ureteric tree volume was quantified and is reduced in Wnt11tm1a/tm1a kidneys. (G) Quantitation of ureteric branch tip number reveals a significant decrease in Wnt11tm1a/tm1a kidneys. (H) The average number of nephrons per ureteric branch tip are increased in Wnt11 mutant kidneys. (J) Classification of the developing nephron structures associated with each tip highlight a bias in Wnt11 mutants towards renal vesicles (RV) and stage 4 + nephrons versus comma/s-shaped bodies. All error bars represent SEM. All significance values were determined by t-test. ns = p > 0.05, * = p < 0.05, ** = p < 0.01, *** = p < 0.001. n = 6 kidneys of each genotype for confocal analyses. N = 8 of each genotype for OPT analyses. Interestingly, the Wnt11 mutant kidneys had a greater number of differentiating structures per tip. On average, there were >2 developing nephrons per Wnt11tm1a/tm1a tip while controls contained <2 (Figure 3H; Figure 3—source data 1). The increased number of developing nephrons were biased towards renal vesicles and Stage 4 + nephrons versus comma- or s-shaped bodies (Figure 3I). Taken together, the Wnt11 mutant phenotype suggests a decrease in branching growth consistent with earlier reports (Majumdar et al., 2003), and an accelerated differentiation of nephron progenitors relative to the stage of ureteric epithelial outgrowth. Given the role for Wnt11 in regulating the Gdnf-Ret signaling axis in the first few branching events (Majumdar et al., 2003), we examined whether tip identity was maintained in Wnt11 mutant kidneys. Etv4 and Wnt11 itself (marked by β-gal in the tm1a allele), maintained their expected tip restricted expression (Figure 4A, data not shown). Additionally, we analyzed other markers which restrict nephrogenic niche identity. The matrix protein fibronectin (Fn1) is largely excluded from the nephron progenitor niche of wild type kidneys, though high levels were present within adjacent interstitial progenitors. This is consistent with RNA-seq data which indicates Fn1 is expressed by interstitial and not nephron progenitors (O'Brien et al., 2016). In Wnt11 mutants, fibronectin also accumulated in the nephron progenitor zone suggesting a possible movement of interstitial cells into this region (Figure 4B). Indeed, Foxd1+ interstitial progenitors interdigitated with Six2 +nephron progenitors (Figure 4C). Approximately four times as many Foxd1+ cells contacted ureteric branch tips in Wnt11tm1a/tm1a kidneys (Figure 4D; Figure 4—source data 1). Six2+ cells were also more frequently observed in interstitial progenitor space (Figure 1B,C; Figure 4C). Whereas the nearest neighbor of any Six2+ nephron progenitor cell in wild type kidneys was most likely another Six2+ cell, Six2+ cells were as likely to have a Foxd1+ neighboring cell in E15.5 Wnt11 mutant kidneys (Figure 4E; Figure 4—source data 1). These findings indicate that Wnt11 is required for stratification of progenitor cell types within the nephrogenic niche. Nephron progenitors intermix with interstitial progenitors but no significant changes in gene expression are observed. (A) E15.5 kidneys were sectioned and immunostained for the tip marker Etv4 (red) and cytokeratin (cyan). Distinct ureteric branch tip domains are still present in Wnt11 mutants as indicated (arrowheads). (B) E15.5 sections were stained for the matrix protein fibronectin (Fn1; red) and cytokeratin (cyan). Note the exclusion of fibronectin from the nephron progenitor niche in wild type animals (line marks boundary between the nephron progenitors and interstitial progenitors). In Wnt11tm1a/tm1a kidneys the fibronectin boundary is disrupted and staining observed in the nephron progenitor niche (arrowheads). Insets show zoomed view of the progenitor niche. (C) Immunolocalization of Foxd1 +interstitial progenitors (blue) in conjunction with Six2 +nephron progenitors (red) at E15.5 reveals mixing of the two cell populations in Wnt11 mutant kidneys (insets show zoomed view of cell mixing). Foxd1 +cells can infiltrate (arrowheads) the nephron progenitor niche and are found near the ureteric branch tips (cyan). (D) Quantitation of tissue sections immunostained for both Six2, Foxd1, and cytokeratin. There is an increase in the number of Foxd1 +cells touching the ureteric branch tips in Wnt11 mutants. 30 ureteric tip domains from n = 3 biological replicates were quantified. (E) Quantitation of Six2 cell neighbors. The number of Foxd1 +cells touching a Six2 +cell is divided by the number of Six2 +cells touching the same cell. In Wnt11 mutants a Six2 +cell is just as likely to have as many Foxd1 +neighbors as Six2 +neighbors. Three biological replicates were quantified, 10 Six2 +cells per sample. (F) Fold-changes associated with RNA-seq of either whole kidneys or Six2 +cells from wild type and Wnt11 mutant kidneys. The fold-change was calculated from the average of n = 6 for each genotype in whole kidney analysis and n = 3 for each genotype in the nephron progenitor analysis. Example genes which define each progenitor population (ureteric branch tip, nephron progenitor, and interstitial progenitor) are shown. No significant changes (>1.5 fold change) are observed. All error bars represent SEM. All significance values were determined by t-test. ns = p > 0.05, * = p < 0.05, ** = p < 0.01, *** = p < 0.001. 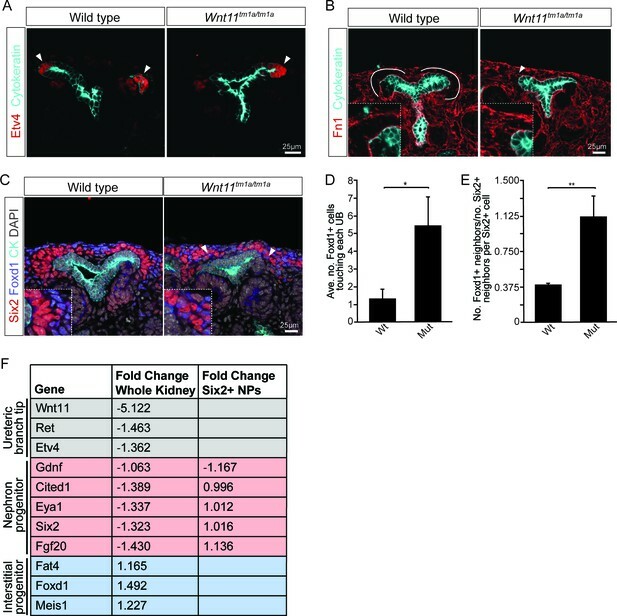 Wnt11 mutants show a significant reduction in membranous attachments of nephron progenitors to the ureteric branch tip. (A) Sections from E15.5 Six2CE/+; R26mTmG/+; Wnt11+/+ and Six2CE/+; R26mTmG/+; Wnt11tm1a/tm1a kidneys (recombination induced 24 hr prior) were immunostained for GFP (green) and cytokeratin (cyan) to visualize the GFP +cells in relation to the ureteric branch tips. Nephron progenitors make long, membranous projections which attach to the ureteric bud. Less extensive projections make contact with the ureteric branch tip in Wnt11 mutants and appear rounder. (B) Quantitation of GFP +cell roundness from samples in A) (length/width = roundness index) reveals that Wnt11 mutant nephron progenitors are rounder. n = 100 cells for each genotype. (C) Wholemount immunostains were carried out on E15.5 Six2CE/+; R26mTmG/+; Wnt11+/+ and Six2CE/+; R26mTmG/+; Wnt11tm1a/tm1a kidneys (recombination induced 24 hr prior) for Six2 (red), GFP (green), and cytokeratin 8/18 (Krt8/18; blue). 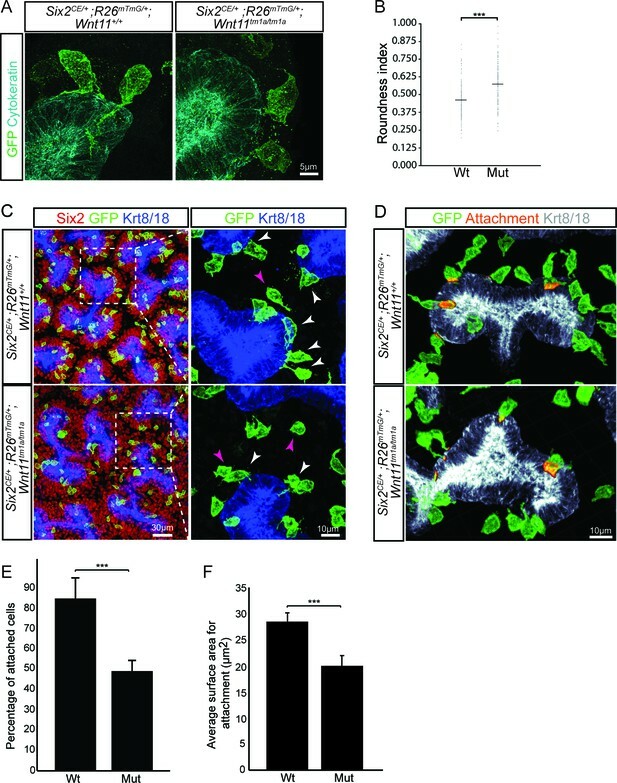 Confocal images show the dispersion of GFP +cells within the Six2 +nephron progenitor niche. Magnified views point to attached (white arrowhead) and detached (pink arrowhead) cells, with more detached cells present in Wnt11 mutants. (D) Kidneys similar to those from C) showing the overlay of GFP (green) and Krt8/18 (grey) signal as an area of attachment (orange). More extensive areas of attachment are observed in wild type kidneys. (E) Quantitation of attachments from samples similar to C) showing a significant reduction in the percentage of attached cells in Wnt11 mutants. n = 200–400 cells from each of 4 biological replicates were analyzed. (F) Quantitation of attachment area as shown in D). The average surface area of attachments is reduced in Wnt11 mutants. All error bars represent SEM. All significance values were determined by t-test. ns = p > 0.05, * = p < 0.05, ** = p < 0.01, *** = p < 0.001. To determine whether loss of Wnt11 altered gene expression within nephron progenitors, we introduced a Six2 promoter/enhancer driven GFP transgene (Six2TGCtg; Kobayashi et al., 2008) into the Wnt11 mutant background. Utilizing the GFP allele, we performed fluorescence-activated cell sorting (FACS) in order to transcriptionally profile the purified nephron progenitors by RNA-sequencing. At E15.5, no significant changes were observed in the expression of key nephron progenitor factors such as Six2, Fgf20, and Gdnf in Wnt11 mutant nephron progenitors (Figure 4F, Supplementary file 1). None of the genes with a greater than 1.5-fold change and reasonable expression level (RPKM >10) showed consistent results across replicates (Supplementary file 1). The up-regulation of Egr1-4, Fos, Fosb, Jun, and Junb in one Wnt11 mutant nephron progenitor sample most likely reflects a variable, isolation-associated stress response (Supplementary file 1; Adam et al., 2017). To avoid isolation artifacts, we compared whole kidney RNA-seq profiles at E15.5. Again, we observed only modest transcriptional changes between wild type and Wnt11 mutant kidneys (<1.5 fold, Figure 4F; Supplementary file 2). The marked reduction in expression of the targeted Wnt11 allele provides an internal control validating the approach and confirming detection is sensitive enough to reveal gene expression changes within a small subset of cells in the kidney (Figure 4F, Supplementary file 2). Thus, Wnt11 likely regulates cell behaviors rather than nephron progenitor gene regulatory programs through β-catenin-dependent transcriptional regulation, consistent with a non-canonical Wnt-signaling action. To gain insight into the molecular pathway underlying Wnt11 action, we characterized the expression of known Wnt receptors and co-receptors in nephron progenitors. RNA-seq analysis of E16.5 isolated nephron progenitors (O'Brien et al., 2018) identified >20 possible candidates with an RPKM >1 and about half with an RPKM >10 (Figure 4—figure supplement 1A). Top candidates included Fzd2, Fzd7, Ryk, Ptk7, and Ror2. Ror2 is highly expressed in nephron progenitors at E13.5 though down-regulated by E15.5 and engages Wnt5a in the regulation of early kidney development (Nishita et al., 2014; Yun et al., 2014). Fzd2 and Fzd7 exhibit redundant functions in convergent extension and ventricular septum closure; the latter is partially mediated by Wnt11 (Yu et al., 2012). We confirmed the expression of these two Fzd receptors within the nephron progenitors by in situ hybridization and examining β-galactosidase activity from the mutant alleles (Figure 4—figure supplement 1B–D; Yu et al., 2012; Yu et al., 2010). Ryk is a Wnt co-receptor with roles in the developing nervous system (Fradkin et al., 2010). Ptk7 is a Wnt receptor with established roles in cell migration and polarization, including morphogenesis of the Wolffian duct (Lu et al., 2004; Xu et al., 2018; Xu et al., 2016). To address the potential for Wnt11 action through these receptors, we examined the organization of Six2 +progenitor niches in homozygous mutant kidneys at E15.5 for several receptor mutants. While neither Fzd2 or Fzd7 mutant kidneys showed a phenotype (Figure 4—figure supplement 1E), a weakly penetrant phenotype (1 in 3 embryos) - a mild disruption of nephron progenitor organization (Figure 4—figure supplement 1G) - was observed in Fzd2-/-; Fzd7+/- kidneys. Unfortunately, the lethality of Fzd2-/-; Fzd7-/- mutants prior to active kidney development precluded complete removal of both these receptors (Yu et al., 2012). Ptk7 mutant kidneys displayed a weak Six2+ nephron progenitor disorganization in one of two embryos examined (Figure 4—figure supplement 1E,F) while progenitor organization was normal in Ryk and Ror2 mutants (Figure 4—figure supplement 1E). In light of these results and the substantial number of Wnt receptors putatively expressed by the nephron progenitors (Figure 4—figure supplement 1A), functional compensation likely hinders the identification of a definitive receptor for Wnt11. To better understand how cellular behaviors in the Wnt11 nephrogenic niche would result in their dispersed phenotype, we combined a tamoxifen inducible Six2-driven Cre strain (Six2CE; (Kobayashi et al., 2008)) and the R26mTmG reporter mouse (Muzumdar et al., 2007) to label the cell membrane of nephron progenitors in wild type and Wnt11 mutant backgrounds. Tamoxifen injection 24 hr prior to tissue collection resulted in labeling of a small subset of nephron progenitors, allowing precise tracking of individual cellular dynamics. In fixed tissue sections, nephron progenitors were packed tightly around the tips and elongated perpendicular to the surface of branch tips with an average width-to-length ratio of 0.450 (Figure 5A,B; Figure 4—source data 1). Wild type GFP+ nephron progenitors sent out prominent membranous projections to the underlying cytokeratin positive ureteric branch tips, often extending over the surface of the epithelium (Figure 5A). In contrast, Wnt11 mutant nephron progenitors were more rounded with an increased width-to-length ratio of 0.565 (Figure 5A,B; Figure 4—source data 1). Further, progenitors also appeared to make fewer and less extensive contacts with the ureteric bud in Wnt11 mutant kidneys (Figure 5A,C). Quantifying the frequency and surface area of GFP+ nephron progenitor contacts with the ureteric branch tips demonstrated that >80% of nephron progenitors exhibit an attachment versus 45% in Wn11 mutants (Figure 5E; Figure 5—source data 1), and the area of contact was reduced by 30% in mutant kidneys (Figure 5D,F). Overall there was no significant difference in the length of these extensions or their angle of protrusion relative to the ureteric bud between either attached or unattached cells of either genotype (Figure 5—figure supplement 1A–D; Figure 4—source data 1 ). To obtain a dynamic insight into nephron progenitor behavior, we performed live imaging in kidney organ culture (Figure 6A; Figure 6—video 1). GFP+ nephron progenitors were divided into three categories based on initial analysis of cell motility, cell contacts, and cell extensions over 14.5 hr of imaging: (1) attached cells with a wide, stable attachment and those in the process of foot retraction or extension (2) detached cells, and (3) cells undergoing mitosis and dispersal (Figure 6B). For live imaging, we utilized Wnt11 heterozygous kidneys as controls. We found no significant difference in the behavior of wild type and heterozygous nephron progenitors, and this allowed to utilize a mating strategy that optimized the number of kidneys we could image and reduced overall animal numbers required. Heterozygous control GFP+ nephron progenitors showed consistent, stable attachments to the ureteric bud detaching as cells underwent cell division (Figure 6A,B,D; Figure 6—video 1). In contrast, Wnt11tm1a/tm1a cells displayed frequent rounds of attachment, detachment, and reattachment (Figure 6A,B,D; Figure 6—video 1). Whether initially attached or unattached, nephron progenitors displayed >4 fold the number of attachments or reattachments in Wnt11 mutant versus control kidneys (Figure 6C; Figure 6—source data 1). Nephron progenitors in Wnt11 mutants also displayed a larger displacement over time and an increased velocity, but no significant difference in meandering (Figure 6—figure supplement 1A–C). In summary, the absence of stable epithelial tip attachment by nephron progenitors in Wnt11 mutant kidneys correlates with a dispersal of the nephron progenitor niche, accelerated nephrogenesis, and the premature loss of the nephrogenic niche. The nephron progenitors of Wnt11 mutants display dynamic attachments and reattachments to the ureteric bud. (A) Still images from Six2CE/+; R26mTmG/+; Wnt11tm1a/+ and Six2CE/+; R26mTmG/+; Wnt11tm1a/tm1a kidney explant cultures live-imaged over 870 min (14.5 hr). GFP +cells are in green, the tdTomato +membrane of all other cells is in grey. Two cells are marked with an asterisk (red or white) in each genotype and followed across the time. The cells marked with red asterisk go through a cell division, the white cells do not. In the control kidneys, the white cell stays attached throughout. The red cell detaches briefly to divide and quickly reattaches. In Wnt11 mutants, both cells display dynamic attachments and reattachments. (B) Schematic of the classification scheme utilized to define cellular dynamics of the nephron progenitors. (C) Quantitation of the average number of attachments and reattachments of cells during live imaging. All het control cells generally begin attached and display few attachments/reattachments. Wnt11 mutant cells, whether they were attached or detached when imaging began, both display numerous attachments/reattachments. (D) Representative tracks of 10–11 individual cells classified as in B) over the course of live imaging. 11 control and 33 mutant cells were analyzed in total. Orange tracks highlights the transition between stages. Control cells stayed attached and only detached to divide. Mutant cells, whether initially attached or detached, show dynamic movements. Blue track = new cell from a division. Green = cell migrated out of the imaging field. All error bars represent SEM. All significance values were determined by t-test. ns = p > 0.05, * = p < 0.05, ** = p < 0.01, *** = p < 0.001. 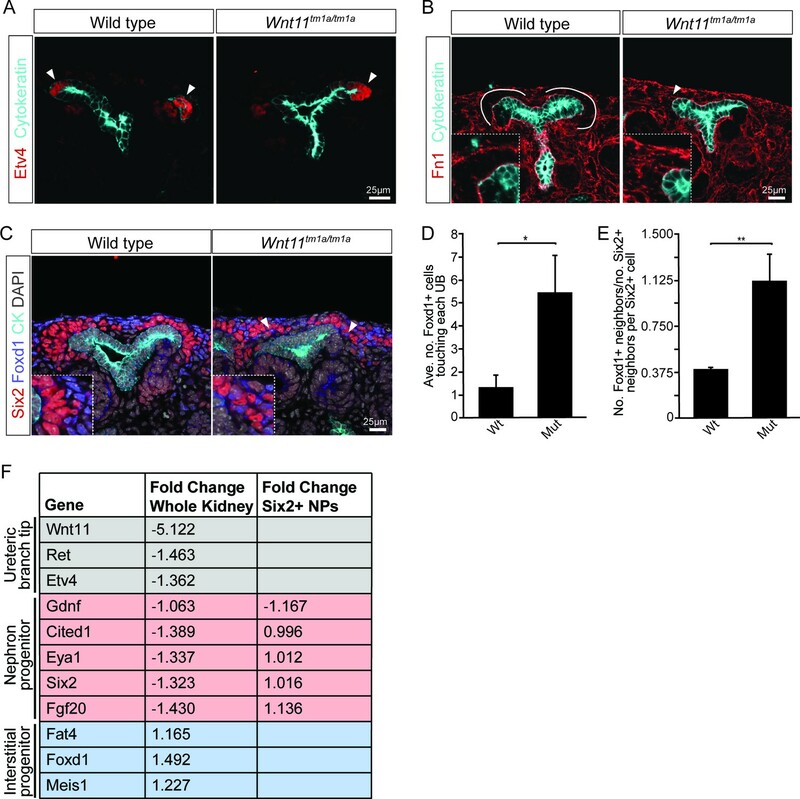 Elongation of control nephron progenitors towards ureteric branch tips suggests cells exhibit a polarized behavior in response to Wnt11 producing cells. Therefore, we analyzed several indicators of nephron progenitor polarity. During directed cell migration, Golgi are oriented to the leading edge of the cell. Analysis of wild type E15.5 kidneys showed an asymmetry in the cellular location of the Golgi apparatus to the distal half of nephron progenitors, furthest from the ureteric epithelium (Figure 7A). However, a bias in Golgi positioning within nephron progenitors was not observed in Wnt11 mutant kidneys (Figure 7A–C). As a second measure, we analyzed the localization of integrin α8. Integrin α8 (Itga8) is synthesized by nephron progenitors and binds nephronectin (Npnt), a matrix protein secreted by the ureteric epithelium, a critical interaction for mammalian kidney development (Müller et al., 1997; Linton et al., 2007). Integrin α8 is polarized on the surface of nephron progenitors concentrating in the membrane closest to the ureteric branch tip (Figure 7D,E; (Uchiyama et al., 2010)). However, this polarization was lost and integrin α8 was dispersed throughout nephron progenitors in Wnt11 mutant kidneys (Figure 7E). Lastly, we examined desmin (Des), an intermediate filament protein. In contrast to nephron progenitors in control kidneys which showed an extensive accumulation of proximally localized desmin within 5 μm of ureteric branch tips, a substantial desmin accumulation was observed outside of this ‘near-tip zone’ in Wnt11 mutant kidneys (Figure 7F,G). 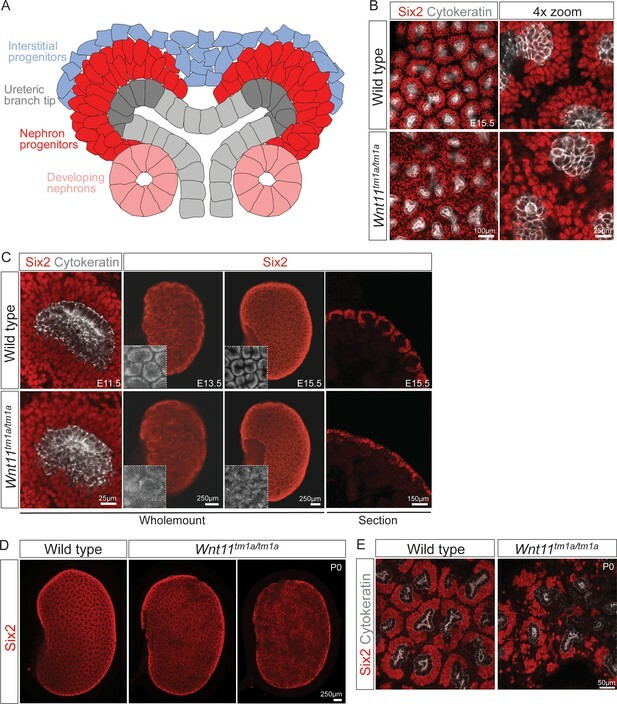 These data highlight several aspects of cell polarity within mesenchymal nephron progenitors that are dependent on Wnt11 production by ureteric branch tips. Nephron progenitor polarity is disrupted in Wnt11 mutants. (A) E15.5 kidney sections were immunostained for Six2 (red), GM130 (Golgi; green) and DAPI (grey). The Golgi (white arrowheads) show a polarization to the distal end of nephron progenitors in wild type kidneys and this polarization is disrupted in Wnt11 mutants where they are localized closer to the ureteric branch tip (white outline). (B) Staining for GFP (green), GM130 (red), and cytokeratin (cyan) highlighting the normal polarization of Golgi within the nephron progenitor at E15.5. The letter ‘a’ marks the distance from the cell center to the foot of the cell (contact with tip) and ‘b’ marks the distance from the Golgi to the foot. (C) Ratio of the distances described in B) for wild type and mutant cells. Wild type cells show a smaller ratio indicating the Golgi lie farther from the ureteric tip than Wnt11 mutant cells, supporting their polarized nature and the loss in Wnt11 mutants. Three biological replicates and ~20 cells from each replicate were quantified. (D) E15.5 kidney sections immunostained for GFP (green), integrin a8 (Itga8; red) and cytokeratin (CK, cyan). Image shows the overlap of GFP +signal with Itga8 in cells close to the tip (white arrowhead), suggesting polarization of Itga8. (E) E15.5 kidney sections immunostained for Six2 (red), Itga8 (green), and cytokeratin (cyan). Arrowhead points to Itga8 polarization towards the ureteric branch tip in wild type kidneys, which is lost in Wnt11 mutants. (F) E15.5 wholemount immunostains for Six2 (red), desmin (Des; green), and cadherin 1 (Cdh1; blue) show the polarization of desmin foci (Des-foci) toward the ureteric branch tip which is disrupted in Wnt11 mutant kidneys. Since the desmin stain appears aster-like with wispy projections, the central focal point (foci) were identified for ease of distance quantitation. Foci were automatically located by Imaris imaging software as the most intense focal point of the desmin stain. (G) Quantitation of the percentage of desmin foci located greater than 5 μm from the ureteric tip in each genotype showing the greater dispersion from the tip in Wnt11 mutants. 385 foci from five control tips and 353 foci from four tips were analyzed. All error bars represent SEM. All significance values were determined by t-test. ns = p > 0.05, * = p < 0.05, ** = p < 0.01, *** = p < 0.001. Our detailed analysis of the kidney phenotype in Wnt11 mutants reveals a critical role for Wnt11 signaling in the organization and cellular dynamics of nephron progenitors in the nephrogenic niche of the mammalian kidney. In the absence of Wnt11 signals from the ureteric branch tips, the nephron progenitors cannot maintain stable attachments to the tips. As a result, nephron progenitors mix with the adjacent interstitial progenitors, undergo an accelerated differentiation, and are prematurely depleted, leading to a significant reduction in nephron endowment. The nephrogenic niche is continually moving which presents a problem for keeping together coherent, spatially-defined communities of interacting progenitor types. Our data indicates that Wnt11-dependent interactions are critical for maintaining progenitor niche integrity over the course of mammalian kidney development. Human nephrogenesis persists for a much longer period than that of the mouse: 30 weeks versus 11 days (Little and McMahon, 2012). Maintaining an organized nephron progenitor niche throughout that period, to generate an average of one million nephrons per kidney (Hoy et al., 2003), presents a challenge on a different scale. Interestingly, SIX2+ nephron progenitors display a tight association with the ureteric branch tips in the human kidney (O'Brien et al., 2016; Lindström et al., 2018) suggesting a conservation amongst mammalian species in mechanisms organizing the nephrogenic niche. Consistent with a role for WNT11 in these events, WNT11 shows a similar ureteric branch tip-restricted expression in the developing human kidney (Rutledge et al., 2017). We previously showed that Wnt11 regulates the early ureteric branching program with Wnt11 mutants generating a smaller kidney, consistent with our current analyses (Majumdar et al., 2003). The phenotype was attributed to the disruption of a reciprocal signaling axis between Wnt11, Gdnf, and Ret. This was based on the observations that (1) at E12.5 Wnt11 mutants showed reduced Gdnf expression in the overlying capping mesenchyme populations as assayed by in situ hybridization, (2) ectopic Gdnf elevated Wnt11 expression in the ureteric epithelium, and (3) a genetic interaction was observed between Wnt11 and Ret mutant alleles (Majumdar et al., 2003). Together these data supported a model wherein Gdnf signaling by mesenchymal progenitors acting through the Ret receptor within ureteric branch tips promoted Wnt11 expression, and Wnt11 signaling to the underlying nephron progenitors promoted Gdnf production and normal epithelial branching. However, by E13.5, no difference was observed in Gdnf expression between wild type and Wnt11 mutant kidneys suggesting a transient requirement for this positive feedback loop (Majumdar et al., 2003). In line with these results, our RNA-seq data shows no significant change in expression of Gdnf (or any other gene) in E15.5 nephron progenitors from Wnt11 mutant kidneys. Similarly, Npnt mutants show reduced Gdnf expression at E11.5 but normal levels at E13.5 (Linton et al., 2007). In contrast, the novel phenotype we describe here, a dispersed, disorganized nephron progenitor population, is persistent throughout development, and it is most likely this and not the early reduction in branching that is the major contributor to the premature loss of nephrogenic niches and the marked reduction in nephron number in the adult kidney. Consistent with this view, half of the nephrons are generated from nephron progenitor cells between P0 and P4 (Short et al., 2014), the time when nephrogenic niches are substantially reduced in Wnt11 mutants. Through our limited labeling of nephron progenitors, we observe a direct dynamic interplay between nephron progenitors and the ureteric tips that harbor the progenitors for the ureteric epithelial network of the collecting system. These results are in line with prior insights into the cellular dynamics within nephrogenic niche (Combes et al., 2016). In this previous study, wild type nephron progenitor attachments to the ureteric tips were assayed, but fewer stable attachments were observed than in the current study. These prior observations utilized a cytoplasmic fluorescent protein to label cells, whereas the current analysis used a membrane localized reporter that facilitates better resolution of membrane processes. The elaboration of membranous protrusions is a common behavior of mesenchymal cells and has been noted previously for nephron progenitors. Studies dating back to 1975 have identified by light and electron microscopy that such cellular protrusions are sent out by nephron progenitors towards the ureteric epithelium (Lehtonen, 1975; Minuth and Denk, 2016). Our studies suggest these cell-cell contacts may facilitate the tracking of nephron progenitor cells with outgrowing branch tips and forming a polarized cell barrier of nephron progenitors that separates nephron and interstitial progenitor niches. In other developing systems, notably the Drosophila imaginal disc and vertebrate limb, long membrane extensions have been linked to transmission and reception of signals within distinct signaling pathways (Sanders et al., 2013; Kornberg and Roy, 2014). Whether the observed extensions play a role in active signaling mechanisms within the nephrogenic niche warrants further exploration. The ureteric epithelium is the source of Wnt9b which has been shown to play a critical role in inducing nephron progenitor cells (Carroll et al., 2005). Interestingly, despite the dispersal of nephron progenitors away from ureteric branch tips, we observe an accelerated differentiation of nephron progenitors that would appear to be at odds with what is normally a Wnt9b-mediated differentiation process. However, it is difficult to predict the outcome on the basis of our current understanding of the complex roles for signaling and cell organization. For example, Wnt9b is also linked to progenitor expansion (Karner et al., 2011), together with localized production of a large number of other signals from nephron progenitors, interstitial progenitors and ureteric progenitors (McMahon, 2016) and it is the integration of all of these that will determine cell behavior. The physical disruption of normal cell boundaries is likely to significantly modify these signaling inputs. Wnt11 could also mediate Wnt9b effects on nephron progenitors, normally working to prevent their induction. Differences in cell shape and polarization may dictate their differentiation capacity. Alternatively, a reduction in Wnt11 signals could allow differentiation of nephron progenitors through the action of an additional commitment regulator away from the tip. Wnt11 signals predominantly through non-canonical pathways; for example, in Xenopus and zebrafish development, where Wnt11 controls cellular behaviors necessary for convergent extension during embryogenesis (Heisenberg et al., 2000; Tada and Smith, 2000; Marlow et al., 2002; Ulrich et al., 2005), or in mammalian heart development, where Wnt11 directs cell behaviors responsible for outflow tract morphogenesis (Zhou et al., 2007). Cells respond to non-canonical Wnt signals typically by rearranging the cell polarity, cytoskeletal organization, adhesive properties, and cell motility. Signal transduction activates downstream signaling cascades which modify cell activities without substantial alteration in transcriptional programs, although JNK- and NFAT-mediated transcription can be activated in some cases (van Amerongen, 2012). Our findings support a non-canonical action for Wnt11 in the kidney, though evidence is predominantly the absence of a transcriptional readout on removing Wnt11 signaling and the associated cell phenotypes displayed by nephron progenitor cells in Wnt11 mutant kidneys: a loss of polarity in the organization of cells and cellular contents, and reduced stabilization of membrane contacts suggestive of reduced adhesive contacts that likely underscores the enhanced cell mobility of nephron progenitors. A future analysis of the requirement of key non-canonical pathway components will provide additional resolution to pathway action. Given the observed nephron progenitor phenotypes and the fact that these cells directly contact Wnt11 expressing cells in ureteric branch tips, nephron progenitors are the likely direct target of Wnt11 action. However, proof will again require an insight into Wnt11 transducing mechanisms. We performed extensive analysis of several Wnt receptor mutants to obtain an insight into the transducing receptor. Though the results are not definitive, single or combinatorial mutations in Ptk7, Fzd2, and Fzd7 resulted in weak, and weakly penetrant, kidney phenotypes resembling the Wnt11 mutant linking these receptors to Wnt11 signal transducing processes. Redundancy amongst vertebrate Wnt receptors is more the rule than the exception. For example, Fzd2 and Fzd7 are known to be functionally redundant in convergent extension and cardiac development (Yu et al., 2012), Fzd1 and Fzd2 are partially redundant in processes such as palate closure (Yu et al., 2010), while Fzd4 and Fzd8 are both implicated in modulating branching morphogenesis in the developing kidney (Ye et al., 2011). Clarity on the cellular target and receptor and downstream mechanisms of Wnt11 signaling will entail the analysis of multiple alleles with the additional requisite that their activity can be specifically removed within cell types of interest in the nephrogenic niche, most notably the nephron progenitors. In conclusion, these studies have uncovered novel aspects of nephron progenitor behavior in response to Wnt signaling. The findings underscore the importance of progenitor niche organization to proper kidney development and nephron endowment. Further insights into Wnt11 action will help inform efforts to recreate kidneys ex vivo through the generation of nephrogenic niches that have replicative, self-organizing capability. All mouse handling and husbandry were performed according to guidelines issued by the Institutional Animal Care and Use Committees (IACUC) at the University of Southern California and after approval (protocol #11893). Six2TGCtg and Six2CE mice were generated previously as described (RRID:IMSR_JAX:009606, RRID:IMSR_JAX:032488; (Kobayashi et al., 2008)). Fzd2 (B6;129-Fzd2tm1.1Nat/J, Stock No: 012821; RRID:IMSR_JAX:012821), Fzd7 (B6;129-Fzd7tm1.1Nat/J, Stock No: 012825; RRID:IMSR_JAX:012825), Ror2c (B6;129S4-Ror2tm1.1Meg/J, Stock No: 018354; RRID:IMSR_JAX:018354), and Rosa26mTmG (B6.129(Cg)-Gt(ROSA)26Sortm4(ACTB-tdTomato,-EGFP)Luo/J, Stock No: 007676; RRID:IMSR_JAX:007676) were all purchased from Jackson Labs (JAX). Wnt11tm1a(KOMP)Wtsi Knockout First ES cells (JM8.N4 line; Targeting project CSD47978; RRID:IMSR_KOMP:CSD47978-1a-Wtsi) were purchased from the EUCOMM/KOMP Repository. ES cells were injected into albino-B6 blastocysts by the Genome Modification Facility (Harvard University) to generate founders. All mouse strains were maintained on the C57BL/6J background (JAX Stock No: 000664; RRID:IMSR_JAX:000664). Ryk mice were previously described (RRID:MGI:2667559; (Halford et al., 2000)). Ptk7 mice were previously described (RRID:MGI:3047812; (Lu et al., 2004)). Genotyping for all JAX strains was performed as described for each line on the JAX website (www.jax.org). Wnt11tm1a mice were genotyped with the following primers: Wild type allele: F-ACCTGCTTGACCTGGAGAGA, R-AAGTGTTATTCGGGCCACTG; Mutant allele: F-ACCTGCTTGACCTGGAGAGA, R-CCAACTGACCTTGGGCAAGAACAT. In situ hybridizations were performed as described on GUDMAP for sections and wholemounts. (www.gudmap.org; McMahon group protocols). Probes for Wnt11, Fzd2 and Fzd7 are those previously utilized (www.gudmap.org; Wnt11 assay ID: N-H6DT; Fzd2 assay ID: N-H5QG; Fzd7 assay ID: N-EDX6). For β-galactosidase assays, whole embryos or kidneys were collected, fixed for two hours in 4% paraformaldehyde, and kidneys were either kept whole or cryosectioned; whole embryos were cryosectioned. Standard protocols were utilized for X-gal staining of tissues. For wholemounts, kidneys at the appropriate stage (E11.5, E13.5, E15.5, or P0) were collected and fixed for 20 min in 4% paraformaldehyde. They were washed 3x in PBS (5 min each) and put into block solution for 1–2 hr (block = PBS + 10% sheep serum +0.1% Triton X-100). Block was removed and primary antibodies diluted in block solution were added to each. Kidneys were incubated overnight at 4°C. The next day samples were washed for 5 min at room temperature with PBS + 0.1%TX100. They were subsequently washed 3x for ~2 hr each wash at 4°C. Samples were incubated with the appropriate species-specific AlexaFluor secondary antibody (Life Technologies) diluted 1:250 in block solution overnight at 4°C. The samples were washed again as previously described. Samples were counterstained with DAPI if necessary. Wholemount kidneys were imaged with a ZEISS Axio Zoom.V16 Fluorescence Stereo Zoom microscope or Leica SP8 inverted confocal. For kidney sections, samples were collected, fixed for 1–2 hr in 4% paraformaldehyde, immunostained, and imaged with a Nikon Eclipse 90i epi-fluorescent microscope, Zeiss LSM 780 inverted confocal microscope, or Leica SP8 inverted confocal as previously described (Park et al., 2012). For Figure 7A, Huygens deconvolution software was utilized post-imaging. Antibodies utilized in this study include: Six2 (Proteintech, 11562–1-AP, RRID:AB_2189084, 1:1000 for section, 1:250 for wholemount), pan-cytokeratin (Sigma, C2931, RRID:AB_258824, 1:250), GFP (Aves Labs, GFP-1020, RRID:AB_10000240, 1:500), integrin α8 (R and D Systems, AF4076, RRID:AB_2296280, 1:500), Etv4 (Abgent, AP6642B, RRID:AB_1967633, 1:500), Krt8/18 (Abcam, ab53280, RRID:AB_869901, 1:500), Cdh1 (BD Transduction Laboratories, 610182, RRID:AB_397581, 1:500), Foxd1 (Santa Cruz Biotechnology, sc-47585, RRID:AB_2105295, 1:1000), fibronectin (Sigma, F3648, RRID:AB_476976, 1:500), desmin (DAKO, M0760, RRID:AB_2335684, 1:500), GM130 (BD Transduction Laboratories, G65120/610822, RRID:AB_398141, 1:500), and β-galactosidase (Biogenesis, 4600–1409, RRID:AB_2314513, 1:1000). Wholemount immunostained kidneys were imaged by either confocal or optical projection tomography (OPT) as previously described (Short et al., 2014). Quantitative analyses from confocal images (Six2 +nephron progenitors, DAPI +tip numbers, cap volume, tip volume, nephron number per tip, nephron type) and OPT images (tree volume, tree length, number of tips; additionally analyses from Tree surveyor can be found in Figure 3—source data 2) were performed as previously described (Short et al., 2014). Kidneys were collected from 6 week old male and female animals. Six kidneys were analyzed from each genotype (wild type, Wnt11tm1a/+, and Wnt11tm1a/tm1a). Nephron counts were performed using the physical disector/fractionator combination (Cullen-McEwen et al., 2012a). Estimations of glomerular volume and renal corpuscle volume were obtained by dividing the total volume of the kidney occupied by either glomerular tuft or renal corpuscles by the number of glomeruli counted (Cullen-McEwen et al., 2012a; Cullen-McEwen et al., 2012b). Kidney volume was estimated by the Cavalieri principle. Paraffin sections (5 μm) were stained by hematoxylin and eosin and imaged by brightfield microscopy on a Nikon Eclipse 90i. Pregnant female mice were injected with tamoxifen (1 mg tamoxifen/40 gm of animal) 24 hr prior to embryo collection. E11.5 kidneys were dissected and embedded into 40 µl of DMEM:Matrigel (Corning, BD354277) at a 1:1 ratio. The kidneys in Matrigel were then placed on a MatTek 35 mm culture dish (MatTek P35G-0–20 C) and the Matrigel was allowed to set for 45 min at 37°C, 5% CO2. Subsequently, 2 ml of kidney culture media (DMEM +10% fetal bovine serum +1X Glutamax +1% Penicillin/Streptomycin) was added to the dish. The kidneys were cultured overnight at 37°C, 5% CO2. During the overnight culture the kidneys flattened against the MatTek glass bottom surface. The dish was placed within an Ibidi culture chamber (IBIDI) which was heated to 37°C and is gassed to 5% CO2. The cultures were allowed to equilibrate for 1 hr prior to imaging. Single-cell tracking and imaging was performed using a Leica SP8 using a 40x objective (40x/1.30 Oil HC PL APO CS2). 512 × 512 images were captured at every 10 min through whole tips at step-interval of 3 μm in the z-direction. Laser lines and detectors were adjusted to for GFP, RFP, and transmitted light capture. Data-sets were captured over 16 hr periods with a 10 min interval. In total,>5 Six2CE/+; R26mTmG/+; Wnt11tm1a/+ and > 4 Six2CE/+; R26mTmG/+; Wnt11tm1a/tm1a were imaged as described above. To reduce the number of kidneys and animals necessary as some kidneys would fail to grow or imaging would prove unsuccessful due to drift out of imaging plane/area, Wnt11tm1a/+ animals were crossed to Wnt11tm1a/tm1a animals to produce only heterozygous or mutant animals for analyses. We found no significant difference between wild type and heterozygous nephron progenitor cell behavior. 87 het controls and 62 mutant cells were manually tracked in 3D using the Imaris Track (Bitplane, RRID:SCR_007370) function. Tracks were initially produced in Imaris and manually annotated to ensure accurate progression. We opted for manual tracking as the automated tracking function provided poor accuracy despite excellent signal-to-noise ratios in the samples. Because the tracked cells were located at the tip of a growing structure, the overall movement of the cells was heavily influenced by the general movement of the growing organ. To account for this, we therefore used drift correction to adjust for the frame-by-frame kidney growth. Cell tracking was performed using the GFP reporter which localizes to cell-membranes. As the membrane display a higher level of movement compared to the cell’s actual displacement, we triangulated the tracks to down sample membrane movements (Figure 8). These calculations were performed in MATLAB (MathWorks, RRID:SCR_001622; Figure 6—source code 1). This approach gave a visually improved accuracy for the cell-tracking. Cell movement was tracked from frame 0 but analyses were performed only from frame 10 and onwards (100 min) to ensure that no artifacts were introduced due to setting up the time-lapse capture. Analyses were then performed from frame 10 to frame 97 (870 min/14.5 hr). Triangulation to improve accuarcy of cell tracking. Schematic showing the method of triangulaton used to improve the accuracy of tracking nephron progenitors. Using the time-lapse data captured for cell-tracking, cells were labelled as attached or unattached at frame 10. Attached meant that they had a clear membrane protrusion interacting with the ureteric branch tip. Unattached meant they did not have a protrusion in contact with the ureteric branch tip. Cells were then followed frame by frame and their status recorded as follows: 1 = attached, 2 = unattached, 3 = cell division, 4 = cell death, 5 = out of frame. 11 control cells and 33 mutant cells were monitored. Cells that died or moved out of frame were not included. The lower number for the control cells reflects the observation that no unattached cells were detected in any of the data-sets we analyzed at frame 10. In the mutant kidneys, approximately 50% of cells were unattached and therefore monitored. To statistically evaluate differences between wild type and mutant cells, each cell was scored for the number of times it changed status within categories 1–3. Student’s t-tests were used to compare cell-types. Pregnant female mice were injected with 2 mg of tamoxifen per 40 g of mouse weight at E14.5 and Six2CE/+; R26mTmG/+; Wnt11+/+ and Six2CE/+; R26mTmG/+; Wnt11tm1a/tm1a kidneys collected for analysis at E15.5. The kidneys were processed for wholemount stains for Six2, GFP, Krt8/18, to visualize nephron progenitor cells, membrane-GFP, and the ureteric branch tip, respectively. To determine the attachment size of wild type and mutant cells the following steps were taken utilizing Imaris software (Bitplane): 1. A surface was generated for the ureteric bud (Krt8/18 stain). To improve the signal edge homogeneity for the Krt8/18 stain, a 1 µm Gaussian blur was implemented on the ureteric bud stain. A surface was then constructed for the Krt8/18 stain with a 1 µm surface-detail resolution. 2. A 0.3 µm surface was built for the GFP channel. 3. The GFP surface was then used to mask the Six2 channel and the masked Six2 channel was blurred (Gaussian 0.5 µm) and the spot function used to count Six2+/GFP+ cells. 4. To identify GFP-membrane/Ureteric bud surface contacts the surface-surface contact tool was utilized. To remove noise, the generated surfaces were filtered at a threshold 0.5 µm2. Remaining surfaces were analyzed for area of attachment (µm2) in Imaris. The Six2TGCtg allele was bred onto the Wnt11tm1a genetic background. E15.5 kidneys were dissected out and screened for GFP +fluorescence. Each GFP +kidney pair were put into a 1.5 ml tube and processed individually. Kidneys were dissociated with collagenase/dispase (Roche, 10269638001) at 37°C for approximately 10–15 min, resuspended in PBS containing 2% FBS and 10 mM EDTA, and filtered through 40 μm cell strainer (BD Falcon). GFP +cells were isolated by sorting with a BD FACSAria II. Cells were spun down and resuspended in buffer RLT from the Qiagen RNeasy micro kit. Genotyping was performed and samples from Wnt11tm1a/tm1a; Six2TGCtg/+ and Wnt11+/+; Six2TGCtg/+ animals were utilized for RNA-seq and differential gene expression analysis. RNA was isolated from GFP +cells of the appropriate genotype using the QIAGEN RNeasy Micro Kit. Whole kidney RNA was isolated from either wild type or Wnt11tm1a/tm1a E15.5 kidneys with the QIAGEN RNeasy Mini Kit. Cells were resuspended and vortexed in buffer RLT and whole kidneys homogenized in buffer RLT using a motorized pestle. Whole kidneys were additionally centrifuged through a QIAshredder to shear genomic DNA and reduce viscosity. RNA was isolated following the manufacturer’s instructions. Libraries were constructed from 20 to 50 ng of total RNA by the University of Southern California’s Epigenome Center with the Illumina TruSeq RNA Library Prep Kit V2 following the manufacturer’s instructions with following modifications: End-IT repair from Epicentre was used instead of TruSeq end repair (more favorable volumes). Half of adapter-ligation was amplified for a variable number of cycles depending on input amounts. KAPA Biosystems PCR Master Mix was utilized in place of Illumina's. Samples were run on the Illumina HiSeq 2000. Sequence files were aligned using TopHat v2.0.8b (RRID:SCR_013035) and Bowtie 2.1.0.0 (RRID:SCR_016368) by the USC Epigenome Center using default parameters. BAM files were processed to obtain RPKM values using the Partek Genomics Suite 6.6 software (RRID:SCR_011860, St. Louis, MO, USA). The Partek ANOVA in Partek Genomics Suite 6.6 software was utilized to find the differential expression of genes ('Differential expression analysis' function) between the two genotypes. Associated sequencing files can be found at Gene Expression Omnibus (https://www.ncbi.nlm.nih.gov/geo/, RRID:SCR_007303) under accession number GSE118334. Wiley Interdisciplinary Reviews: Developmental Biology 1:693–713. Methods in Molecular Biology 886:333–350. Methods in Molecular Biology 886:109–119. Journal of Embryology and Experimental Morphology 34:695–705. Journal of the American Society of Nephrology 29:ASN.2017080890. Current Topics in Developmental Biology 117:31–64. Molecular and Cellular Biology 34:3096–3105. Journal of Histochemistry & Cytochemistry 38:385–392. Cold Spring Harbor Perspectives in Biology 4:a007914. Cold Spring Harbor Perspectives in Biology 4:a007864. Thank you for submitting your article "Wnt11 signaling regulates the organization and actions of kidney nephron progenitors to determine nephron endowment" for consideration by eLife. Your article has been reviewed by three peer reviewers, including Jody Rosenblatt as the Reviewing Editor and Reviewer #1, and the evaluation has been overseen by Didier Stainier as the Senior Editor. The following individual involved in review of your submission has agreed to reveal their identity: Fernando Martín-Belmonte (Reviewer #3). 1) That the authors make the title clearer and more descriptive of the actual findings. Currently, we found it a bit vague and we think adding a bit of the mechanistic findings would recruit more interest and readership. 2) We found that there were too many figures, making the manuscript less punchy than it should be. Therefore, we suggest reducing some of the figures, described below. Please also check that the video can be played universally, too. The manuscript by O'Brien et al. reveals an interesting mechanism for how a polarity defect brought about by a Wnt11 mutation can disrupt kidney development by disrupting the proliferation/differentiation axis. They document with excellent quantitative evidence that the kidneys of Wnt11-/- mice are smaller due to premature differentiation of cells. This amplification of differentiation is due to disruption of interactions of the progenitors to their niche, which they show is due to alterations in cell polarity. I think that this is an interesting paper that shows very nicely how subcellular defects translate to whole tissue defects and think it will be of interest to many people in development. It is also unusual in that it shows that the cell-cell interactions override transcription, as there were no clear detectable transcriptional changes. 1) The title is not very clear or descriptive and should be changed to say more precisely what the conclusions say. 2) I could not get the one video to work. It would be nice to see more videos of this and determine if there is not also some defect in attachment of the dividing cell to its matrix that the authors don't discuss. I tried several ways to get the video to work, so make sure that their compressions allow access to several playback applications. 3) A schematic at the beginning of the paper showing the layout of the kidney cells divide and differentiate would be very helpful. O'Brien et al. show that nephron progenitors cannot maintain stable attachments to the ureteric bud tips in the absence of Wnt11, resulting in dispersion and premature depletion/differentiation of the progenitors, which could presumably explain nephron number reduction in the adult kidneys. The presented images are of high quality and the quantitative data are solid. Especially, time-lapse analysis convincingly demonstrates the unique movements of the mutant nephron progenitors, which can only be addressed with the authors' techniques. Weakness: the authors fail to identify direct signaling defects downstream of Wnt11, despite the extensive analyses using multiple mutant mice and RNA-sequencing. It remains unclear which non-canonical pathway is affected, leading to the impaired polarity of the progenitors and their unstable attachments to the ureteric buds. Nonetheless, the conclusion that Wnt11 functions through the non-canonical pathway in the kidney is novel and attractive. I believe that this manuscript is suitable for publication in eLife. In this manuscript, the authors present evidence for a novel action of ureteric branch tip-derived Wnt11 in progenitor cell organization and interactions within the nephrogenic niche, ultimately determining nephron endowment. 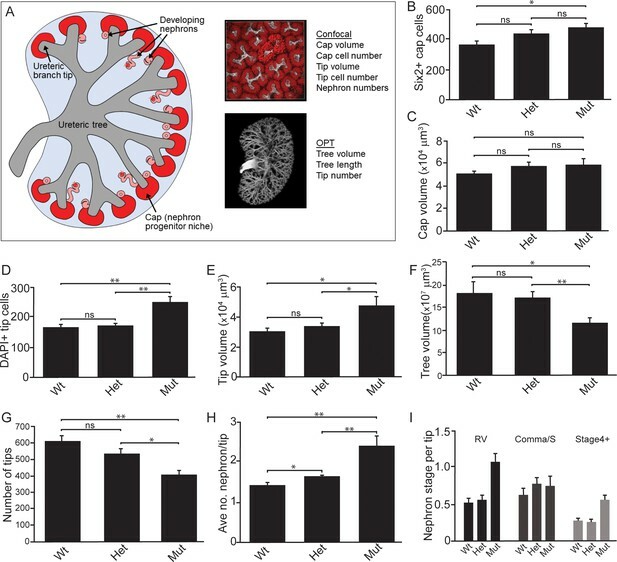 They identified that this phenotype derived from the dispersion of nephron progenitors from their restricted niche in Wnt11 mutants, which intermix with interstitial progenitors. Indeed, they observe that nephron progenitors lose stable attachments to the ureteric branch tips in the absence of Wnt11, so they continuously detach and reattach from the ureteric cells. 1) This manuscript, although very interesting and necessary, suffers from an explicit mechanistic characterization. The authors show how Wnt11 affects the polarization and attachment of the Six2 progenitors to the ureteric tip cells that generate this signal. However, we do not know at the molecular level how this response occurs, although the authors have presented us with some small details of this response, such as the location of integrins and the orientation of the Golgi (Figure 9). Therefore, the article format that is presented is probably excessive. A report format with 4-5 figures would probably be more appropriate. In general, Figures 1-4 are very descriptive, and in some cases provide redundant information. For instance Figure 2E and 3D show both kidney volume at different ages using different methods to estimated volume. Considering the length of the manuscript regarding the number of figures (9), the authors should consider reducing the first four figures to just two, and relocate some of the information to the supplementary section. 2) Similarly, I am not very convinced whether Figure 6 should be included among the central figures of the article. The conclusions derived from these data are relatively uninteresting for the scientific community. It is true that there is much redundancy in the Wnt receptors, and that therefore it is a recurrent problem when identifying the molecular mechanisms associated with a specific Wnt signaling (Wnt11 in this case). However, either the results of the mutant Ptk (Figure 6C) and that of the double mutant Fz2 / Fz7 (figure S3D) are characterized more in detail, or all this information is transferred to supplementary data. 3) Comparing kidney volume of younger (Figure 2E) vs. older kidneys (Figure 3D) younger kidneys appear to be bigger than older kidneys. Please explain. 4) Since eLife is not a journal specialized to nephrology topics, a sketch of the so-called "nephrogenic niche" would facilitate reading and understanding for non-renal-development experts. 5) Figure 4. Please introduce an example image where the regions Hull, Cap, Tip, Tree are labeled, and from where volume/length was calculated. We would like to thank you and the other reviewers for the overall positive review of our submitted manuscript. We appreciate the comments and have revised as suggested. Namely, we have 1) given the manuscript a new, more descriptive title and 2) have shortened the number of figures. We agree and have now changed the title to “Wnt11 directs nephron progenitor polarity and motile behavior ultimately determining nephron endowment”. We believe this more specifically states the mechanistic findings of Wnt11 actions in the kidney. We apologize for the inability to play the video. We will upload a video file that has been viewed on several computer formats to ensure playback. In general, it appears that wild type nephron progenitors detach from the matrix in order to divide before reattaching. In the Wnt11 mutants, (an example can be seen in the supplementary video provided), cells already detached can undergo division. However, we have not captured sufficient numbers of dividing cells in our time lapse imaging to definitively say this. The minimal labeling approach limits the number of cells that are captured undergoing division. We have included a schematic of the nephrogenic niche in Figure 1 to help orient readers. […] 1) This manuscript, although very interesting and necessary, suffers from an explicit mechanistic characterization. The authors show how Wnt11 affects the polarization and attachment of the Six2 progenitors to the ureteric tip cells that generate this signal. However, we do not know at the molecular level how this response occurs, although the authors have presented us with some small details of this response, such as the location of integrins and the orientation of the Golgi (Figure 9). Therefore, the article format that is presented is probably excessive. A report format with 4-5 figures would probably be more appropriate. In general, Figures 1-4 are very descriptive, and in some cases provide redundant information. For instance Figure 2E and 3D show both kidney volume at different ages using different methods to estimated volume. Considering the length of the manuscript regarding the number of figures (9), the authors should consider reducing the first four figures to just two, and relocate some of the information to the supplementary section. Unfortunately, we were unable to determine a mechanism despite a strong effort; more complex genetic tools would be necessary to thoroughly address this. We have reduced the number of main figures from 9 to 7. Figure 6 has been moved to the supplement (Figure 4—figure supplement 1) and Figures 1 and 2 have been combined into Figure 1, with some of the data moving to the supplement (Figure 1—figure supplement 2). We feel this is a sufficient compromise. Although some information may appear redundant, measurements such as kidney size at different stages account for any changes in phenotype over time or phenomenon such as compensatory cellular hypertrophy which could occur. Figure 6 has been moved to the supplement (Figure 4—figure supplement 1). The units were confusing between the two figures as they do not match. The units in Figure 2E (now Figure 1—figure supplement 2B) have been changed to mm3. (1 mm3 =1x109 μm3). A schematic of the nephrogenic niche has been added to Figure 1A. A schematic of the regions measured and what imaging was utilized for their analyses is included in what is now Figure 3A. We have removed the hull measurement as we felt it was not adding any additional information. These have now been included in the text. We would like to thank Dr. Wange Lu (University of Southern California) and Dr. Xiaowei Lu (University of Virginia) for the Ryk and Ptk7 embryonic kidney tissue that was used in our analyses, respectively. We also thank Dr. Seth Ruffins (University of Southern California) for help with microscopy. © 2018, O'Brien et al.